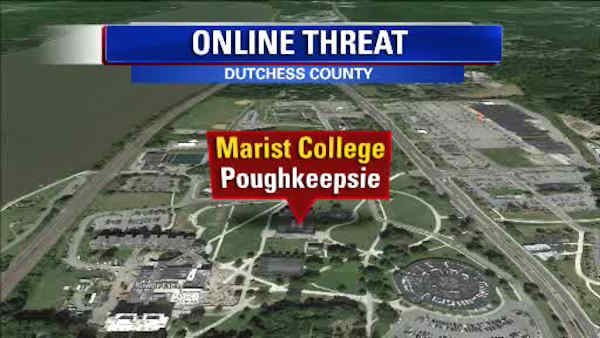 POUGHKEEPSIE, N.Y. (WABC) -- A teenager has been arrested in connection with an anonymous, online threat to Marist College in Poughkeepsie Friday that forced officials to shut down the school. Poughkeepsie police said a 16-year-old boy from Poughkeepsie was arrested Friday afternoon. He allegedly posted two messages to Twitter containing threats to the school within a 7-hour period. The first tweet sent at about 6 a.m. was general in nature, but police said the second one hours later was specific. Both came from the same account. "Those 'tweets' did threaten to commit an offense which created a fear whereupon Marist College closed the campus for a period of time," police said in a news release. After the tweets were first noticed, school officials closed all academic buildings on the campus. Students who live on campus were told to stay in their residence halls. Employees and students were told to not come to campus until further notice. Campus is Open: authorities have determined no credible threat to the College. Campus is now open and evening events on as scheduled. Police said the "investigation determined that the threat was not legitimate and the suspect acted on his own." Detectives worked with Twitter to track down who posted the messages on Twitter. The police had a large presence on campus for most of the day.